Concordia’s Green Party Campus Club co-hosted a climate change workshop on Oct. 4 with Our Horizon, a new not-for-profit organization whose first campaign involves placing climate change warning labels on gas pumps. Rob Shirkey, a lawyer from Toronto who launched the organization in January 2013, led the discussion. Our Horizon is campaigning for Canadian municipalities to pass a by-law that requires gasoline retailers to use the aforementioned labels. The organization believes passing this by-law would create a global precedent, as Canada did with its cigarette warnings which are comparable. Sixty-four countries now have these visual warning labels, demonstrating their effectiveness in changing consumers’ attitudes and behaviour, explained Shirkey. Shirkey expects these labels to have a unique purpose in the context of climate change. While most people are well acquainted with the issue, the consequences still seem far away for many. “This warning label takes that far away consequence [of climate change], be it species extinction, ocean acidification, drought and famine, and actually brings it into the here and now,”said Shirkey. Shirkey spoke about the psychology of climate change, explaining that when responsibility for something is shared among many, individuals are less likely to take action. For more information, visit http://ourhorizon.org. Press photo. While Our Horizon expects to see some individual behaviour change, they’re more interested in seeing collective change. 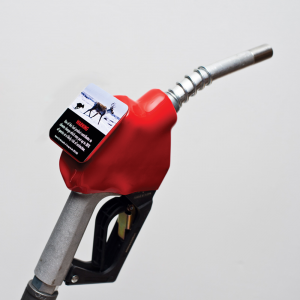 The organization feels that placing warning labels on gas pumps will play a significant role in the fight against climate change at a low cost. Our Horizon wants to create space for businesses and governments to provide solutions for climate change. Politicians will be more inclined to adjust their positions, for example, if enough people show their concerns. “If necessity is the mother of invention, this just injects a little more necessity into the system,” he added. The workshop at Concordia was part of the organization’s cross-Canada tour, stopping at elementary schools, high schools, universities and community organizations. At workshops in Toronto, Shirkey had children draw their own warning labels, which they will present to city councillors. Sixty-four countries now have these visual warning labels, demonstrating their effectiveness in changing consumers’ attitudes and behaviour. Press photo. Our Horizon is asking Canadian municipalities to pass this by-law since it’s the most accessible level of government. They developed a database with the contact information of every municipal representative in the country, so Canadians can advocate this in their own community. They urge Canadians to contact their councillors or speak up at their local city hall. “This is one of these rare instances where if you convince someone and speak from the heart and share your concerns on this, you can actually change the world,” said Shirkey. They’re already gaining support around the world through Facebook and Twitter. Our Horizon has received endorsements by organizations including the David Suzuki Foundation and has been featured on major media outlets. While on tour, Our Horizon brings a trophy, Canada’s Climate Change Heroes Cup with them. “Whichever municipality passes this by-law is actually showing global leadership on this issue and we want to recognize that, so we’re going to engrave [the councillors’] names here,” said Shirkey. The Green Party of Quebec, led by Concordia student Alex Tyrrell, supports Our Horizon. Concordia’s Green Party Campus Club welcomes students to reach out to them to get involved.